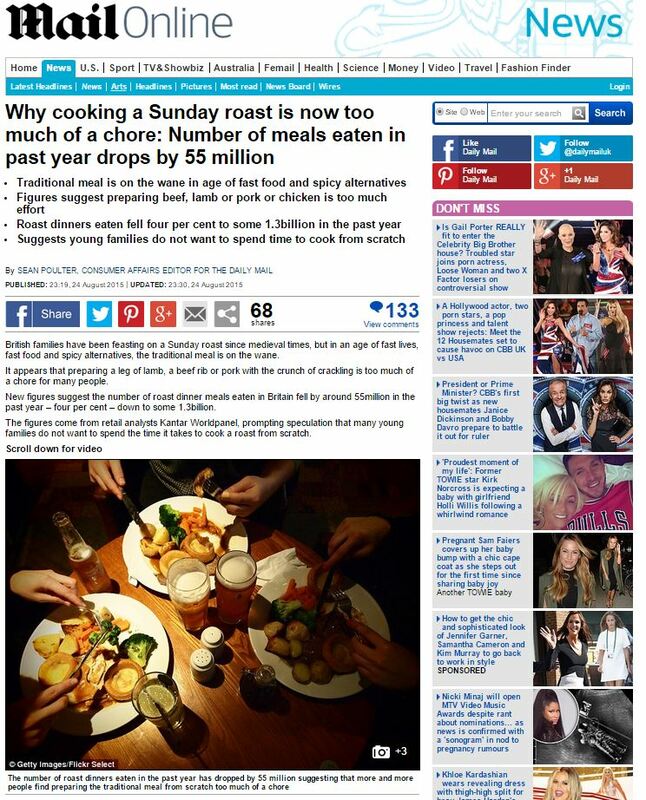 New research has revealed that the popularity of the traditional Sunday roast dinner is waning. Figures from market analysts Kantar Worldpanel revealed that during the last year, the number of families tucking in to a roast dinner has dropped by four per cent to 1.3 billion. 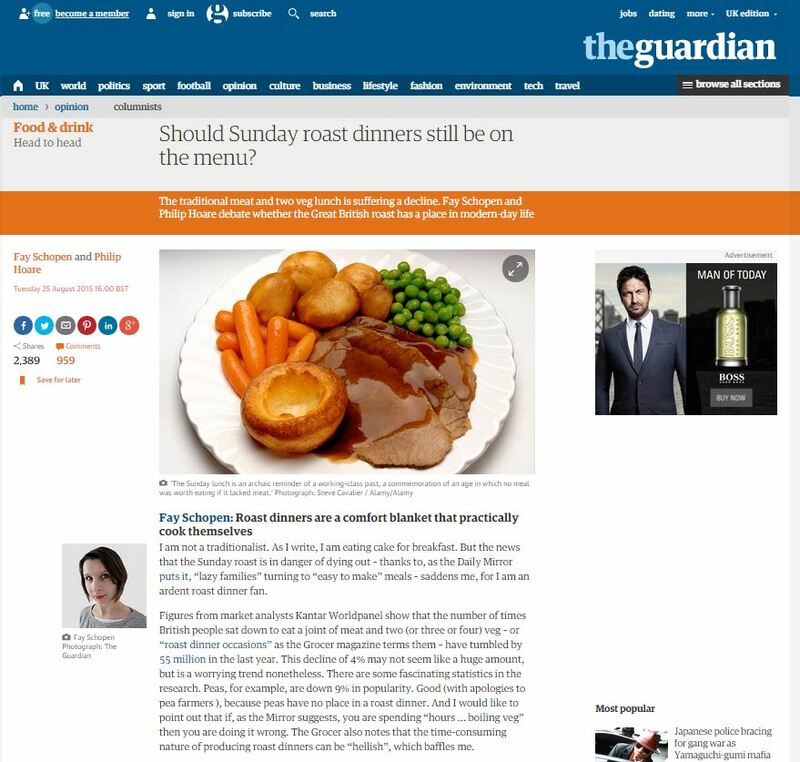 Should Sunday roast dinners still be on the menu? British families have been feasting on a Sunday roast since medieval times, but in an age of fast lives, fast food and spicy alternatives, the traditional meal is on the wane. It appears that preparing a leg of lamb, a beef rib or pork with the crunch of crackling is too much of a chore for many people. New figures suggest the number of roast dinner meals eaten in Britain fell by around 55million in the past year – four per cent – down to some 1.3billion. 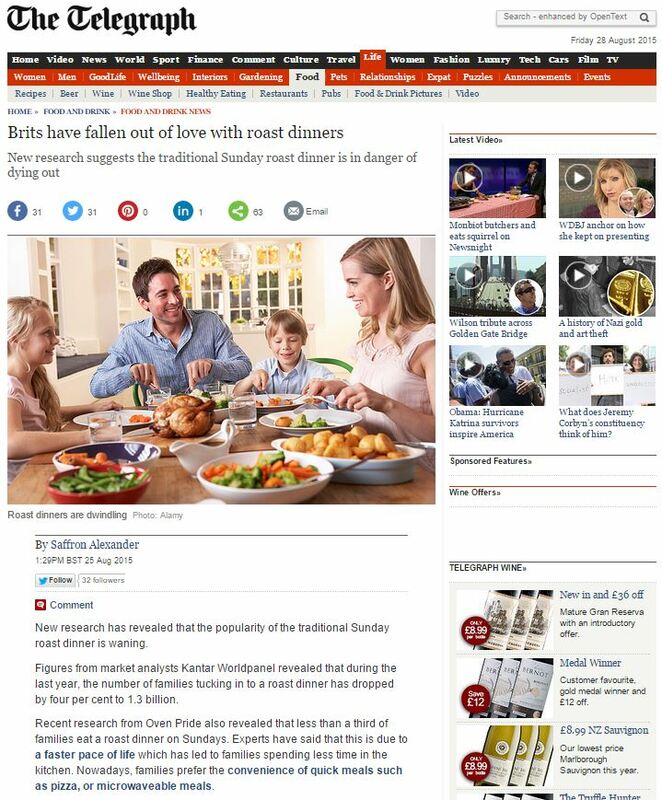 The figures come from retail analysts Kantar Worldpanel, prompting speculation that many young families do not want to spend the time it takes to cook a roast from scratch. 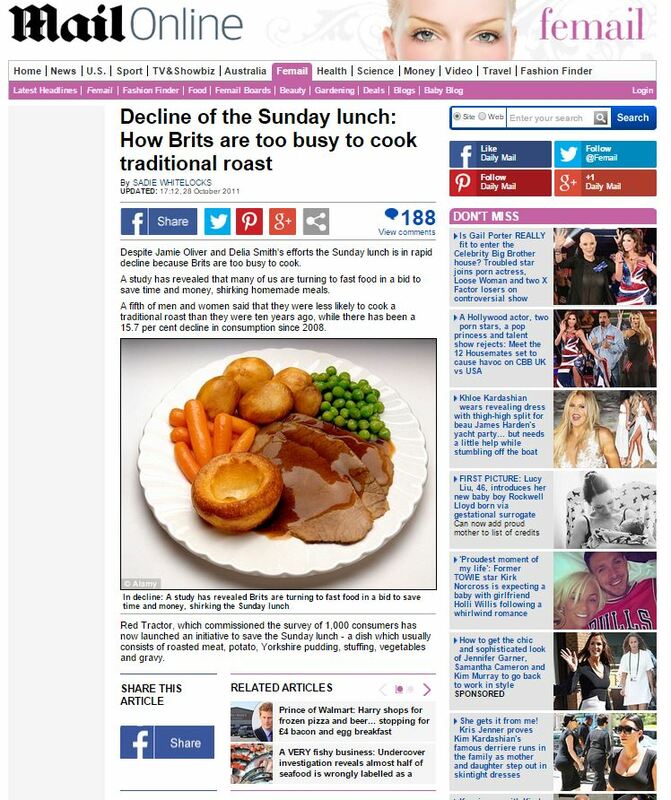 It’s the death of a great tradition, as English as fish and chips and colonialism, but sadly the great British Sunday roast is on the way out. No wonder this made national news in three separate newspapers! But while roast potatoes might be disappearing from our tables, research from the Agriculture and Horticulture Development Board revealed that sales of mashed potatoes was up by 20 per cent. Mike Whittemore, head of beef and lamb trade marketing at the AHDB, told trade magazine The Grocer: “Consumers are crying out for a new approach to the roasting category, but the way many retailers present and market roasting joints does not reflect this. So not only is this a mere advert, it’s also an advert based on a hook that’s at least 4 years old. Ah, British traditions! This entry was posted in Oven Pride, The Grocer and tagged Agriculture and Horticulture Development Board, daily mail, Fay Schopen, guardian, Kantar Worldpanel, Mike Whittlemore, Oven Pride, Philip Hoare, Sadie Whitelock, Saffron Alexander, Sean Poulter, telegraph, The Grocer on August 30, 2015 by Michael Marshall.